Over the last month penguins have been in the news again here in Cape Town. After a mystery oil spill off the Cape coastline early in August 450 penguins have been covered in oil and have had to be rescued and taken to Sanccob for cleaning. Cleaning is hard work as each penguin has to be scrubbed for over an hour with an oil solvent to get the oil off them. Once the penguins have been cleaned their rehabilitation starts. The solvents that are used to clean the penguins also clean out the natural oils in their plumage and if they were to be released immediately they would die from dehydration as their bodies have lost their insulation. Once cleaned they are kept in enclosures where they are fed six pilchards per day by hand for a number of weeks before being released back into the wilds. 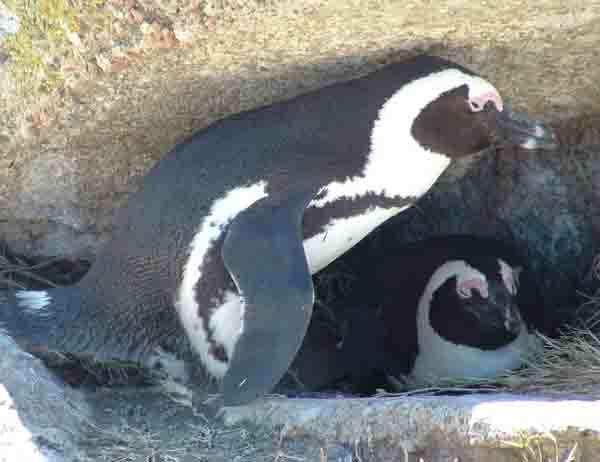 Cape jackass penguins,or African penguins as they are now known are the main species found along the Cape coastline are at risk and are listed as a vulnerable endemic species. Their numbers have dwindled drastically from the beginning of the 20th century when there over 9 million birds on the West Coast Islands. There are a number of reasons for the decrease with the main reason being the lack of food, caused by over fishing the pilchard stocks along the west coast of South Africa and Namibia. Penguins have some interesting characteristics. When they go foraging they form groups of about 10 birds and then forage in a range of about 20 kilometres from the colony. It's when they are out foraging that they are at risk of being oiled. Adult birds can swim at speeds of up to 12 kilometres per hour underwater and if you should try to catch one you would have no chance as they are liked greased lightning. This week some of the 400 oiled penguins that were rescued after the mystery spill in early August were released. The release of the birds is very interesting as they are transported to a beach near Milnerton in boxes with 5 penguins per box. Once on the beach the boxes which are sealed to keep the penguins from escaping are opened and turned on their sides. To facilitate a mass release all the boxes are turned over at the same time. Suddenly as the penguins emerge there are a hundred or more penguins on the beach all looking seawards. Once released some of them make a bee line for the sea while others stand and look around and admire the scenery before waddling off down to the water. To identify the released birds when they arrive back in their colonies the birds each get a pink dot sprayed on their white breasts. At sea the penguins gather beyond the surfline in groups to orientate themselves before starting their long swim back to their colonies. The penguins released this week were rescued from Dyer Island near Hermanus, Cape Agulhas, Bettys Bay and the Boulders near Simonstown. It will be interesting to monitor how long it takes for them to arrive back in their colonies.